Below are a few articles about fishing the area that you might enjoy! West Fork Smallmouth Bassin' - It don't get much better than this!! Moose Lake Walleyes - Fishing the Wood!! Flowage Muskies - Lots of fish and a few big hawgs too!! Some of the finest fishing in the State of Wisconsin can be found in Sawyer County and the Hayward Lakes area. Trophy musky, walleye, smallmouth bass and panfish all swim in these waters with many monster fish being taken annually. Moose Lake and the world famous Chippewa Flowage are some of the bodies of water you will be able to experience in our area. Moose Lake is a 1600 acre, dark water flowage surrounded by the 850,000 acre Chequamegon National Forest , making it a true sportsman's paradise. Moose lake has a reputation as being one of Wisconsin's finest musky lakes, and it also has good populations of walleye, smallmouth bass, and panfish. Then if you really want to get away from it all and experience some great fishing, try a canoe or float trip down the West Fork of the Chippewa river that flows into Moose Lake. Along with Moose Lake and the Chippewa River there's no shortage of other places to fish either. In fact, there's so many places to go, it's sometimes hard to decide just where to go. Click Here to view a Hydrographic Map of Moose Lake. There is a place, where generations of anglers have enjoyed some great fishing and even in today's fast paced world where everything is constantly changing, time has basically stood still there. This place is the West Fork of the famous Chippewa river up stream from Moose lake located East of Hayward Wisconsin. What can you expect in the fishing there today? Well, along with some decent walleye fishing and way better than average musky fishing, there's also some great smallmouth bass fishing that just seems to keep getting better all the time. And that's what I'm talking about here! 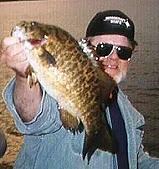 Plenty of smallmouth with some fish running up to around 6 or 7 pounds, maybe even bigger! Why is the bass fishing getting better you ask? Well, the rise in the popularity of catch and release and the fact that for around 7 or 8 years now the bass season has only been open to only catch and release till later in June are a couple of good reasons. In fact, these factors alone are probably the biggest reasons for the increase in both size and numbers in bass when other fisheries, especially those in less remote locations, are often struggling to keep up with increased pressure. Still the fact is it is good here and getting better! Whether you fish with a spinning rod or a fly rod, there a fish here plenty big enough to test your skills as an angler. Then besides good fishing, a trip down the "Chip" is a great experience and has some beautiful scenery too. Paddling along the path of the old voyageur's and lumberjacks there are some big wild rice fields, lots of wild country, and plenty of wild critters to see. While there are a lot of miles of river upstream from Moose Lake and Sportsmen's Lodge to canoe and fish, the most popular stretch's are those from Clam lake to Moose, and from highway GG down the Torch river to the "Chip" at Cattail lake then on down to Moose Lake. Along with a lot of river and a just few minor rapids to contend with, there are also several small lakes and wide spots in the river. As for distance or time, the shorter trip from 174 down can be done in 3 hours or less, ( the average is around 5 hours ), but you can also spend all day fishing it and exploring. Then on the longer trips from Clam Lake or GG, you need to get started early in the day or spend overnight camping along the river in the National Forest if you want to spend any time fishing. Some of our better known lakes just a short drive from our resorts are, the Chippewa Flowage that produced the current world record musky, Lac Courte Orielles, Grindstone, Big Round, Teal, Lost Land, Moose, and many more, each with it's own fishing characteristics. With Over 16,000 acres of water, the "Chip" is the largest wilderness lake in Northwest Wisconsin and the third largest lake in the state. This vast, sprawling lake has around 250 miles of shoreline and 140 or more islands. It's fishery consists of Musky, walleye, smallmouth and largemouth bass, panfish, northern pike and a few other species.Lodging is available at several resorts and you can camp both at several campgrounds and on several of the islands.Then when it comes to rivers along with the Chippewa, there's the Flambeau, the St.Croix, the Namekogan, the Brule, and hundreds of other smaller rivers and streams, most of which also provide good fishing. Then there's the big lake, Lake Superior, with all it's bays and tributaries. Just a couple examples are the Chequamegon Bay where you can find great trout, salmon, walleye, and northern pike fishing as well as world class smallmouth fishing. Then too, there's the St. Louis Bay and River where you can find some great walleye, northern pike, bass, and musky fishing. No matter what your preference, from remote streams to sprawling inland lakes to the vastness of Lake Superior, Northwest Wisconsin has it. And if you just want to check out the shops and attractions or play a round of golf, we have plenty to offer there as well.